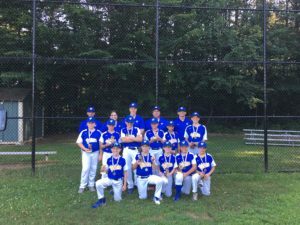 The Williston Little League All-Star team, ages 9-11, was the runner up at the recent District 1 Championship. left to right, front row: Connor DuBois, Noah Musgrave, Ryan Gross, Shamus Phelan and Cooper Ludwar. From left to right, second row: Nate Couture, Johnathan Deyo, Jackson DuBois, Jackson White, Tae LeGrande and Riley O’Brien. From left to right, third row: Coaches Adam Deyo, Lyndsey O’Brien, Ken Couture, Rick Musgrave and Jason DuBois. Teammates not pictured: Blake Marshall and Calvin Castle.